Catalytic carbon has long been recognized as the most effective method of chloramine reduction. Our research supports that view. Removing chloramines from city water is one of the hot topics in water treatment. Driven by internet discussion and advertising, there are lots of theories, lots of controversy, and a whole lot of myths. When people look for a chloramine reduction product one of the first questions they ask is, “How much does it remove?” The expected answer is a neat percentage. What they usually get from us, though, is a truthful but vague answer that goes something like, “Well, chloramine reduction can depend on a lot of variables, like the rate of flow through the filter (residence time), physical factors like turbidity and temperature, pH, mineral content of the water, pre-treatment, etc. In other words, it can vary a lot.” A truthful answer, but not very satisfying. So, to put some numbers into the equation, we decided to do some testing of our own on the actual products we sell and on our own tap water. Our testing is not offered as a guarantee of performance in all situations–just a snapshot of what we found when we tested various products being fed our local chloramine-treated tap water. For the purpose we bought a Hach Pocket Colorimeter that tests only chloramine and ammonia. We tested actual consumer products, some brand new, some well used, at varying flow rates, using our local tap water for the tests. In every case, we tested both chloramine and ammonia. When chloramine is reduced by filtration, according to the standard explanation of the process, chlorine is separated from the ammonia and converted to chloride. The ammonia is left behind as an undesired by-product. More about ammonia later. According to the city of Denton’s most recent water quality report, the average chloramine level in our tap water is 3.41 milligrams per liter (mg/L). Before each sequence of tests, we did a “base line” test from the tap and made the assumption that the product we were testing was being challenged with that amount of chloramine and ammonia. In most cases, we found the actual at faucet chloramine content to be a little less than the city’s average. In all we did over a dozen tap water tests, which showed chloramine levels from 1.83 mg/L to 3.52 mg/L with an average of 2.6 mg/L. The readings were taken at several locations in the city, both at our business and at homes where we have equipment installed. In other words, these are “real life” tests using the water that comes through the pipes, not laboratory simulations. The Chloramine Catcher is our signature “whole house” chloramine product, a backwashing filter with catalytic carbon. 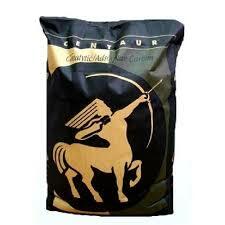 We supply it with Centaur catalytic carbon and offer Jacobi Aquasorb coconut shell catalytic as an alternative. We call it the “Chloramine Catcher” because it is designed for chloramine reduction. In spite of its pretentious name, the filter has no magic properties or secret ingredients: it is a catalytic carbon backwashing filter built with a Vortech mineral tank and a tough Fleck 2510 control valve. We sell the same filter for hydrogen sulfide treatment for wells. In our chloramine reductions tests, the Chloramine Catcher lived up to its name, removing 98.2% of the chloramine the first day we tested it, 99.2% on the second test, and 100% on the third. (“One hundred percent” means reduced to below the detection level of the test, 0.01 mg/L. Keep in mind that in water treatment, nothing removes all of anything.) This was one of three tests we made where chloramine was reduced to below the detection point of the test equipment. Our office version of the Chloramine Catcher, the one we tested, is a 10″ X 54″ tank with 1.5 cubic feet of Jacobi Coconut Shell Catalytic Carbon. The carbon is about three years old, but it has had an easy life, filtering only for two bathrooms and a utility sink. Just broken in well. We also tested a Chloramine Catcher with Centaur Catalytic Carbon installed in a Denton home. Chloramine reduction was 100%. The unit was over 10 years old, but the carbon had been replaced about two months previous. At 0.5 gpm flow rate – 99.6% chloramine reduction. The lesson, of course, is that residence time matters. People who use this cartridge in an undersink or countertop drinking water filter get better performance than those who put it in a garden hose filter and spray water at 2 gpm on their turnip patch. Lesson number two: any good carbon filter will remove chloramine if you give it enough time. By contrast, the Pentek ChlorPlus 10 in the 9.75″ x 2.5″ size, a filter designed specifically for chloramines, got 99% chloramine reduction at 0.5 gpm and the same 99% at 1.0 gpm. Two other tests of the cartridge at 0.5, prefiltering for an ammonia-removal test, got 100% and 99.5% reduction. We tested a variety of carbon filters, from an inline refrigerator filter to a whole house carbon block–some made with standard carbon, some with catalytic. A standard GAC refrigerator filter with coconut shell GAC fared worst with 45.3% chloramine reduction at a moderate but unmeasured flow rate. We tested a “whole house” MatriKX CTO (4.5″ X 20″) installed at a Denton home. This is a 5 micron standard coconut shell carbon cartridge. The cartridge, about a month old, removed 95% of the chloramine at “shower speed,” 3 gpm, although the manufacturer makes no chloramine reduction claim. We tested the same filter after two more months’ use and it removed 97%. We tested a 2.5″ X 9.5″ version of the MatriKX CTO (same filter as above, but drinking water size) that we use as an RO prefilter. We ran it at 350 milliliters per minute (the very slow feed flow rate of an undersink reverse osmosis unit) and it removed 99.6% of the 2.75 ppm chloramine in the tap water that day. We tested two 2.5″ X 10″ granular carbon filters, one with standard coconut shell GAC (97.8% chloramine reduction at 0.5 gpm) and one Centaur Catalytic Carbon (100% chloramine reduction at 0.5 GPM). We did several tests on our house brand reverse osmosis units, some in our office, some in homes, and with different configurations and filter age. Chloramine reduction ranged from 100%–the most common–down to 97.6%. Most units were standard 3-stage systems with MatriKX CTO prefilter and MatriKX CTO Plus post filter. Some had 4th-stage post filters which we added to test ammonia reduction. In general, all RO units we tested removed almost all the chloramine. We tested a standard KDF-based Sprite shower filter, known to be an excellent chlorine reducer. We tested twice with a shower water feed rate and it removed 20% and 21%. We tested a Vitashower Vitamin-C shower filter (technically an ascorbic acid injector rather than a filter). On the first test–with only a 5 minute break-in rinse, in violation of the manufacturer’s instructions–it removed only 42%. After a 10 minute break-in rinse, however, it removed a respectable 94.8%. KDF plays an essential role in chloramine reduction, according to internet lore. We put 1.5 lbs. of KDF 55 into a cartridge, without carbon, and tested at 1 gpm. Result: 18.2% chloramine reduction. We put a MatriKX CTO Plus cartridge after the same KDF filter and the result was 97.7% reduction at 1 gpm. We tested a 1.5 lb. KDF 85 cartridge at 1 gpm with the result of only 01.4% reduction–probably not quite as good as running the water through a paper towel. We tested a Pentek GRO membrane without pre- or post-filters. As expected, chloramine reduction was an insignificant 9.8%. The standard explanation for chloramine reduction is that the catalytic action of the carbon breaks the bond between chlorine and ammonia then converts the chlorine to harmless chloride. The ammonia is left behind. In other words, after treatment you end up with more ammonia than you started with. Virtually all of our tests supported this concept by showing an increased presence of ammonia after the chloramine was reduced by the filter. The table below shows carbon filters removing chloramine. Note that in each case the liberated ammonia stays in the product water. Granular catalytic carbon (Centaur) cartridge, new but well broken in. The theoretical removal of ammonia is a complicated issue, and literature reveals that removing ammonia after chloramine reduction doesn’t always follow expectations. The table below includes carbon filters and RO units followed by a post treatment device. Black and White Reverse Osmosis, 3 stage, with softening cartridge added. Black and White Reverse Osmosis, 3 stage, with zeolite cartridge added. Black and White Reverse Osmosis, 3 stage, with calcite cartridge added. Unit preceded by a standard carbon block whole house prefilter. Pentek ChlorPlus 10 (9.75″ x 2.5″) Chloramine Reduction Cartridge followed by a softening cartridge @ 0.5 gpm. Pentek ChlorPlus 10 (9.75″ x 2.5″) Chloramine Reduction Cartridge followed by a deionizing cartridge @ 0.5 gpm. Black and White 3 Stage Reverse Osmosis Unit without post treatment. We found the expected, plus a couple of unexpected results. In general terms, contrary to some internet lore (we’ve been told more than once that “chloramine can’t be removed”), chloramine can be removed handily, although it’s considerably harder to remove than chlorine. The same strategies that remove chlorine remove chloramine, although some devices work much better than others. Catalytic carbon is best, but standard carbon also removes chloramine well if you give it enough time. KDF, unless it is followed by carbon, is not an effective chloramine treatment. Vitamin C shower treatment is much more effective than KDF shower filters with chloramine. Theoretically, ammonia should be easily removed by cation exchange after an RO unit but not so easily after a carbon filter. Nevertheless, in the three tests where we used an ion exchange cartridge after a carbon block filter, ammonia was reduced to 0.02, 0.02, and 0.01. This was with feed water with a pH in the high 7’s and 7 grains of hardness. The result indicates that a water softener regenerated well before its hardness endpoint following a whole house catalytic carbon filter would probably do a credible job of ammonia reduction–not good enough, perhaps, for use in dialysis, but quite good for ordinary household use.